Atlantic sea herring have long been recognized as an important prey item for several of the region’s key commercial and recreational predators and protected species, including tuna, striped bass, cod, whales, and seals. Recent efforts from the New England Fishery Management Council (NEFMC) resulted in recommendations to directly account for herring’s role as a food source in the ecosystem by reducing commercial fishing rates and establishing mid-water trawl gear bans in nearshore areas. The management action known as Amendment 8 to the Atlantic Herring Fishery Management Plan was accepted by the NEFMC in September and, if approved by the National Marine Fisheries Service (NMFS), will be implemented in mid-2019. The gear ban area established through Amendment 8, frequently referred to as “buffer zone,” includes a year-round, 12 nautical mile mid-water trawl restricted area extending from the Canadian border to Montauk, with an additional restricted area, up to 20 nautical miles, within two 30-minute squares, known as Blocks 99 and 114, off the backside of Cape Cod. The buffer is intended to minimize the effects of user conflicts and localized depletion, which the NEFMC defined as, “when harvesting takes more fish than can be replaced either locally or through fish migrating into the catch area within a given time period.” Amendment 8 was initiated in 2015 due to concerns with concentrated commercial fishing of herring in specific areas and at certain times, namely off Cape Cod, that may cause impacts on other user groups (other commercial fisheries, recreational fisheries, and ecotourism) that depend on local availability of herring to support business interests. Sea herring are small pelagic fish that migrate in large schools between feeding and spawning areas in the Gulf of Maine, Mid-Atlantic Bight, and Georges Bank. Herring have been harvested from New England waters for centuries, but commercial fishery landings reached a peak in the late 1960s prior to the exclusion of foreign boats, resulting in a collapse of the Georges Bank herring stock. In the absence of intense fishing pressure from European fleets, the stock was rebuilt and US managers encouraged expansion of the herring fishery. 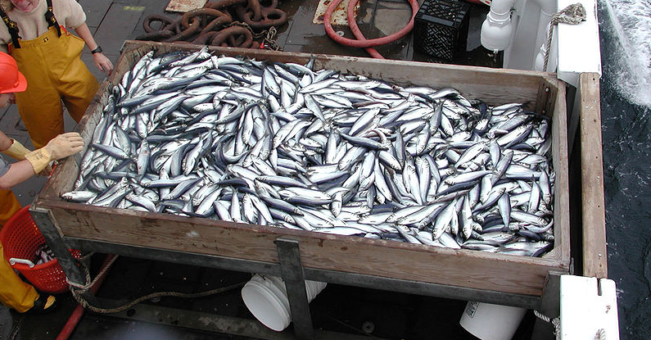 While the majority of US herring landings were from purse seine vessels in the 1970s–1980s, the use of mid-water trawl gear grew in prevalence through the 1990s, raising concern about the potential impacts of large scale removals of herring. Localized depletion of herring in the Gulf of Maine became a concern about 15 years ago, and in 2007 a mid-water trawl restricted season from June–September was adopted for Herring Management Area 1A.